A Labor Day golf outing turned really sour for a Florida foursome. Michael Rich allegedly became enraged over a joke about marking a putt. 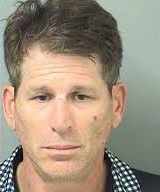 He allegedly proceeded to tear up the green with his cleats, and then attack his playing partners with his putter, snapping while thrashing one man, and then brandishing it like a sword toward another. He’s facing aggravated battery charges. I always wondered what would happen if Lloyd in “Sideways” wasn’t joking when he took off after the rude golfers behind him… I guess now I know. Felonies happen. Here’s the Sideways scene, because it’s awesome. Both of these characters could have been facing charges!